Hair fall is something that we all experience in our lie. A number of factors can lead to hair fall. For some people the problem may not go away and they will suffer from continuous hair fall. Then it becomes important to take intense care of hair. If you see first signs of balding, it is essential that you start taking extra care of your hair and try to prevent falling of hair. It is normal o lose 50 to 100 strands of hair daily. If it is more than that, then it may be an issue. By taking proper care in the beginning itself, you can tackle the problem and also help in re-growing the hair you have lost. 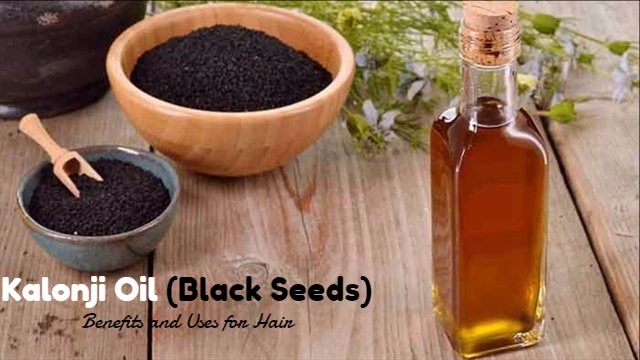 Kalonji black seed oil is very beneficial for hair and can help you fight against hair fall. Kalonji black seed oil is also known as Nigella sativa oil or black cumin oil. How to use kalonji oil for hair loss or hair fall? Take a bowl and combine all the ingredients in it to get a smooth mixture. Massage your scalp with this mixture and work through your hair from the roots to the tips. Now cover your hair with the warm towel. This will improve the efficiency of the hair mask. Let it stay on your hair for 15 to 20 minutes to 1 hour and then wash with shampoo. Honey is a humectant and helps in sealing the conditioning effects of both the oils you have applied on your hair. This makes your hair soft and manageable. You may also drink a mixture of one teaspoon of black seed oil and 1 teaspoon of honey in a glass of water. This not only helps in preventing hair fall, but also offers you a lot of other health benefits. For this you need 2 tablespoon of kalonji black seed oil. Pour the oil into your palms and rub your palms together to warm it up. Now massage your scalp with your palms. Focus more on the areas where there is hair fall. Once you have covered the scalp with the oil, work it through your hair from the roots to the tips. Wait for about 30 minutes to one hour and then you can wash your hair with your regular shampoo. You can use this 2 to 3 times a week. Massaging your scalp helps in increasing blood circulation and stimulating the hair follicles. This way it boosts hair growth. The oil also nourishes your follicles and provides the nutrients needed for producing healthy hair. For this you need 1 tablespoon of black seed oil and 1 tablespoon of olive oil. Take a bowl and mix kalonji oil and olive oil in it. Now massage your scalp well with this mixture, focussing o the areas where you experience hair fall. Once you have applied oil all over your scalp, work the oil through your hair from the roots to the tips. Wait for 30 minutes to an hour and then wash it off with shampoo. Using this 2 to 3 times a week will give you good results. This treatment is very beneficial for those having oily or combination hair because olive oil is very light. It is an excellent hair conditioner and helps in keeping your hair soft and silky. It is great for treating hair issues like hair breakage and split ends. For this you need 1 tablespoon each of black seed oil and coconut oil. Mix black seed oil and coconut oil in a bowl and heat for about two seconds till it is warm. Massage this on your scalp for 15 minutes and then work it through your hair from the roots to the tips. Once you have completely covered your scalp with this blend, wait for about 30 minutes. Now you can wash your hair with shampoo. This is ideal for people with normal hair. Coconut oil has penetrative properties and helps in nourishing the follicles. When combined with black seed oil, it becomes very effective for preventing hair fall. For this you need 1 ½ tablespoon of black seed oil and ½ tablespoon of castor oil. Massage your scalp with the oil blend, giving more attention on the areas where the hair loss is more. Apply it on your entire scalp and then work the oil through your hair from the roots to the tips. Leave it on your hair for 30 minutes to one hour and then wash it off with your shampoo. This is ideal for all hair types. Castor oil has great growth-boosting properties. It can increase the thickness of hair and the rate at which the hair grows. When it is combined with black seed oil, it can prevent hair fall and make your hair grow faster. For this you need juice of one lemon and 2 tablespoons of black seed oil. Take the fresh juice of a lemon and massage your scalp with it. Leave it for 15 minutes and then wash it off with mild shampoo. Let your hair sir-dry and then massage your scalp with kalonji oil for 10 minutes. Now work the oil through your hair from the roots to the tips. Leave it overnight and then wash it off in the morning with shampoo. Apply this 1 or 2 times a week.